This website contains information about Charlotte International Airport, located at North Carolina. This is not the official website. 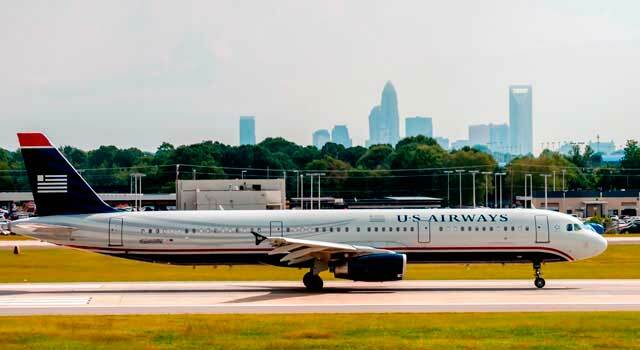 Use this website to quickly find the most important information about Charlotte Airport: Flights (Departures, Arrivals and Delays), Parking, Car Rentals, Hotels near the airport and other information about Charlotte Airport. 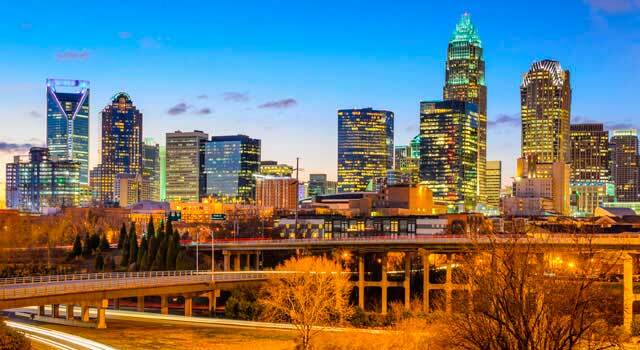 Plan your travel to CLT Airport with the information provided in this site. Check Charlotte Travel Guide at Bautrip for more information about Charlotte. 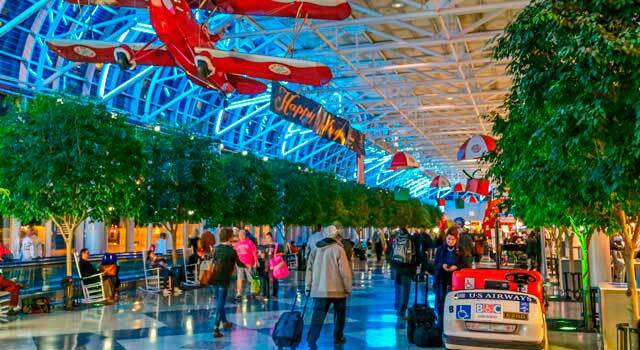 Charlotte International Airport (IATA: CLT, ICAO: KCLT, FAA LID: CLT) officially named Charlotte Douglas International Airport, is an international airport located in Charlotte, North Carolina, United States. It is about 7 miles (10 km) west of Charlotte city center. (IATA: CLT, ICAO: KCLT, FAA LID: CLT) is 7 miles west of Charlotte. Charlotte Airport is the second largest hub for American Airlines. Charlotte Airport served 45.9 million passengers in 2017. There is one terminal divided in 6 concourses. 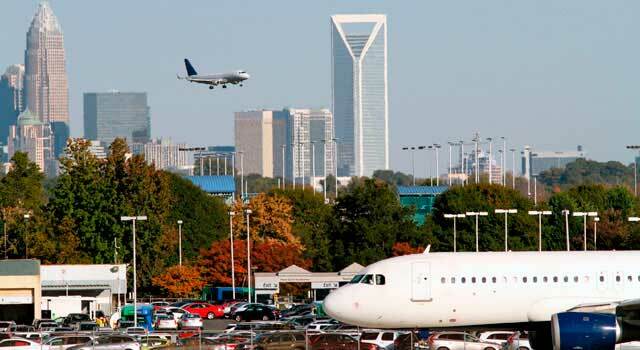 More than 90 percent of traffic in CLT Airport is domestic. About the name: Charlotte Airport is named after former Charlotte mayor Ben Elbert Douglas Sr. Charlotte airport is currently the second largest hub for American Airlines after DallasForth Worth International Airport and, on the East Coast, is the second largest airport. It serves more than 161 nonstop destinations worldwide and more than 700 departures/landings daily. The airport has currently 4 runways, three of those are parallel runways oriented 18/36. . A new runway is going to be built on the next years and it will be Charlotte's longest to date. In 2017, CLT airport handled 45.9 million passenger, reaching a new record. 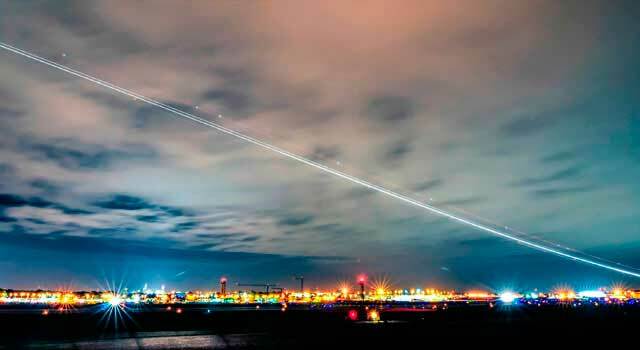 The airport is the 11th busiest airport in the US by passenger traffic and aircraft movements. - Concourse A: It is used by several airlines excluding American Airlines. Air Canada, Frontier Airlines, Delta Air Lines, JetBlue Airways, Southwest Airlines, United Airlines and Via Air. It has 12 gates. - Concourse A North: It is equipped with 9 new gates. It is located at the north of Concourse A. - Concourse B: Is currently served by American Airlines only and it has 16 gates. - Concourse C: Is currently served by American Airlines, it has 18 gates. - Concourse D: It is used for all international arrivals without customs preclearance. It is known as the international concourse of the airport. It has 13 gates. Is used by the following airlines: American Airlines and Lufthansa. - Concourse E: Opened in 2002 is only used by American Eagle flights. It has 38 gates and operates more than 330 flights daily. E1 and E3 are available to be used for any carrier. A New Concourse is planned to be built in the following years in the rental car area, as a separate terminal, only for new international carriers. - 1 Terminal with 6 concourses. - 45.9 million travelers in 2017. - 161 domestic and international destinations. - Averaged nearly 700 daily departures. - Busiest routes are: New York, Dallas, Atlanta, Chicago and Orlando. For any lost item within the airport premises, please contact the Lost and Found Office. Taxis: Get within 17 minutes to downtown Charlotte. Taxis are available at the lower level curbside (Arrivals/Baggage Claim) of the main terminal. Bus: The CATS (Charlotte Area Transit System) provides 2 routes from the airport to the Center City and Northlake and Ride. The general price is $3. Car Rental: The Rental Car Facility is now open and serves all the rental car companies in the airport, except Sixt and Thrifty. Check rental car page on-line for availability and best prices.